I was born in the Moncton Hospital in 1986. I lived in Riverview until I was 5, when we moved to Alma. I started attending Université de Moncton in 2004, and lived in Moncton in fall and winter until 2008, when I moved here year-round. I joke to people "I was born in Moncton, and I'm still here! I haven't gone far in life! ", but I love this city. I can't go for a walk without seeing somebody I know, and that's just from working customer service here in the last five years. Last week, tragedy unfolded. Our beautiful city, a vibrant and close-knit community, was under threat from a gunman. More than a third of Moncton was in lockdown. I had friends who heard the gunshots while out walking, thinking people were setting off fireworks because it was such a beautiful day. I knew at least six families, off the top of my head, who were in the red zone. We weren't, but we were close enough that we didn't want to risk it--the closest police barricade was only five minutes away. #prayformoncton was trending globally on Twitter--a recognition we sadly hoped would be in better circumstances. Everyone in Moncton was somehow affected by the hours of terror that followed. Five officers were shot, three of whom died from their wounds--their families and friends, to say the least, were among the most affected. 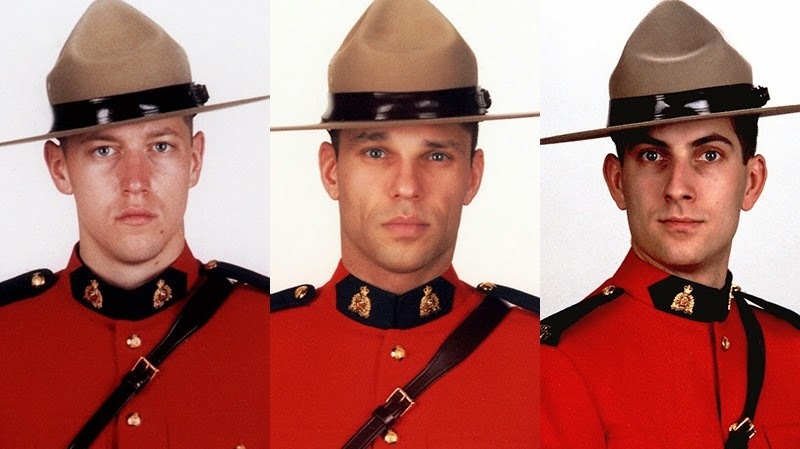 These are the three officers whose names we must remember: Constable Dave Ross, Constable Fabrice Gevaudan, and Constable Douglas Larche. These three men died protecting our city. Despite the terror and fear, though, there was one thing I noticed about the situation that made our beautiful community seem even more so. People were sharing information--not the locations of the RCMP and their movements, mind you, as was requested of us--and putting friends up in their homes. Porch lights were on across the city to aid the police in their manhunt, leaving a city that felt very dark covered in lights of hope. People stayed in their homes in an attempt to make the suspect the only person moving. The whole city was at a virtual standstill as businesses closed and buses were pulled off the roads. When the announcement came that the suspect was in custody, there was a flood of relief. People were on the roads at 1:30 AM, cheering and smiling. I'm sure I'm not the only one who immediately felt safe again. The days that followed the shooter's arrest were filled with such an outpouring of support for the RCMP and other first responders that I couldn't help but be proud. I went to get lunch with my mom the day after, and an officer was behind me in line. With tears in my eyes, I shook his hand and thanked him. I watched as he approached the front of the line and a man tried to pay for his lunch. The woman behind the cash smiled and shook her head, saying "it's on us". Business signs on Mountain Road were changed to say "thank you RCMP". My own workplace started selling muffins, 100% of the proceeds going toward the Moncton Fallen RCMP Members Memorial Fund, and today I am trading in my work uniform of green and black for red and white to show my support. Friday night, a candlelight vigil was held in front of the RCMP's office on Main Street. I've heard mixed reports that anywhere from 2,000-10,000 people were there, but I would believe any number on that spectrum. My husband and I went to witness it, and it was incredible. Flowers covered the steps leading to the building to the point that they had to be left on the street. There was so much love and respect. This is a public thank you to the RCMP, who were professional and dealt with a difficult situation in a way I can't imagine being any better. Thank you for protecting our beautiful city while mourning your friends, who must have been like family members to you. My heart is with the family and friends of everyone affected by this tragedy. Violence causes so much pain in everyone's lives, both physically and mentally. To see Moncton come together in love for each other has been so important during this time. It is my sincere wish that through these horrific events, something beautiful can come, and from what I've seen, it's already begun. Nothing can change what happened, but we can prevent events like this from terrorizing our lives again. Violence can only beget violence; let's try to love each other a bit more. Moncton's motto, by the way, is "Resurgo", which means "I rise up again". Never before has it been more appropriate.